Statua Libertatis, die 8 Augusti 2010. Statua Libertatis (Anglice Statue of Liberty ; Francogallice Statue de la Liberté), vel nomine proprio Libertas orbem terrarum inluminans (Anglice Liberty Enlightening the World ; Francogallice La liberté éclairant le monde), est monumentale signum neoclassicum, quae Insulae Libertatis in Portu Novi Eboraci omnes vectores salutans stat, a Friderico Augusto Bartholdi sculptore ficta, a Gustavo Eiffel architecto erecta, et die 28 Octobris 1886 dedicata. 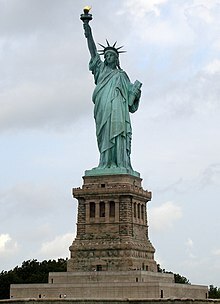 Statua, populo Civitatum Foederatarum Americae a populo Francico donata, est imago mulieris palla vestitae, quae Libertatem, Romanam libertatis deam, exprimit, facem tabulamque ansatam (tabellam legis evocatae) ferens, in qua dies Declarationis Libertatis inscribitur. Catenae ruptae ad pedes iacent. Statua fit iconicus libertatis et Civitatum Foederatarum symbolus. Holdstock, Robert, ed. 1978. Encyclopedia of Science Fiction. Londinii: Octopus Books. Moreno, Barry. 2000. The Statue of Liberty Encyclopedia. Novi Eboraci: Simon & Schuster. Smith, V. Elaine. 1986. Engineering Miss Liberty's Rescue. Popular Science, mense Iunio, p. 68. Vidal, Pierre. 2000. Frédéric-Auguste Bartholdi 1834–1904: Par la Main, par l'Esprit. Lutetiae: Les créations du pélican. Novissima mutatio die 7 Novembris 2018 hora 14:58 facta.